I have spent a lot of time watching this cool infographic from Couponbox. You can watch what Americans are eating, drinking and buying—in real time—this holiday season. Check out the infographic below for more holiday wishes. In a recent survey conducted by Broadview Networks 47% of its customers said they enjoyed a more moderate pace of work during the holidays—yet, at the same time, 38% said maintaining productivity was their biggest challenge. Give your office extension a mobile twin. When employees work remotely, it can sometimes present issues with missing inbound calls from current and potential customers. Features like mobile twinning, which sends inbound calls to mobile and desk phones simultaneously, ensures employees are available at any location at a moment’s notice. The feature helps employees maintain ongoing conversations with their customers, which in turn ensures the business as a whole experiences continued productivity. Keep collaborating. Often times while working remotely, employees feel disconnected from colleagues and projects can stall or halt during out of office time. Features such as chat allow employees to address items with each other briefly, while video, audio and web conferencing allows employees to meet virtually face-to-face for projects or issues that may need ongoing, productive conversation. Advanced solutions allow you to share documents, collaborate, present and host group calls from any device, anywhere. Use cloud file-sharing. When traveling to remote locations [during the holidays or any other time] employees often forget to save their working documents from the shared server to an accessible place such as a flash drive or desktop. Cloud file-sharing solutions allow employees to transfer files through the cloud by simply dragging and dropping files to the location needed. This feature is especially productive for multiple employees working on a single deliverable. 4) Where the Highest-Earners Are? According to an “expansive” study of 23,000 small and microbusinesses from Invoice2go Seattle is America’s #1 city for success, with small businesses in that region invoicing a yearly average of $179,905. San Francisco and New Orleans closely followed, with each business invoicing an annual average of $146,349 and $142,556 respectively. 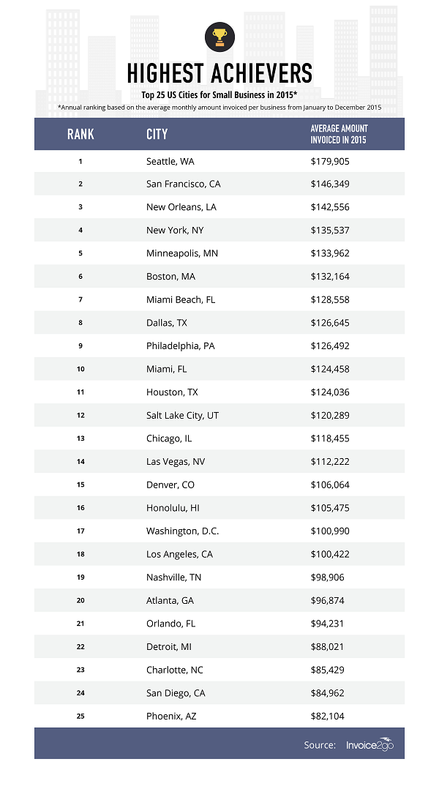 New York, Minneapolis, Boston, Miami Beach, Dallas, Philadelphia and Miami round out the top 10. The first PYMNTS.com SMB Technology Adoption Index, powered by Sage shows 48% of SMBs use one technology supplier to handle accepting payments, processing payroll, issuing invoices and accounting, while 34% use two or more suppliers for their financial technology solutions. “Price isn’t necessarily the primary consideration for SMBs; rather, they want suppliers who can deliver a comprehensive solution to help them smartly manage their companies,” says Paul Bridgewater, CEO of Sage Payment Solutions, the payments division for Sage North America. 64% of SMBs that aren’t currently accepting EMV cards don’t plan to do so. Electronic invoicing is gaining adoption as 31% of SMBs use electronic invoicing, and, of those SMBs, 20% can also accept payments electronically. 46% of SMBs cite not getting paid on time as the most frustrating thing related to receiving payments from customers. The SMB Technology Adoption Index will be released jointly on a quarterly basis by Sage and PYMNTS.com, and will look at business and technology trends impacting SMBs in the U.S. You can find out more about the findings here. NerdWallet is offering a free ebook—a guide to what you should know before you apply for a small business loan. Digital Third Coast in the past year there was a 74% increase in both private and public cloud usage by businesses. In a report for Soliant Consulting they uncovered interesting data on the economic impact of the cloud that shows how the cloud has transformed businesses of all sizes. The report also shows cloud computing is up to 40x more cost effective for a small business compared to operating its own IT system. Big brands spend millions each year on managing their presence in the media through public relations. For small startups that expense is simply and sadly out of reach. But that doesn’t mean you can’t launch into the press spotlight. You can—and you should! Like no other form of marketing, editorial media coverage gives companies an implied third-party endorsement that can drive recognition and sales. Today, more than ever, media outlets are keen on outside content and sources as they deal with a 24/7 news cycle that requires a constant stream of fresh stories. Release the Release: Forget what you’ve been told about the perfect press release. Those should be strictly reserved for formal company announcements, such as financing. Even then, they are rarely effective at getting the media’s attention. Instead, engage reporters on an individual and less formal basis with a tailored and specific “pitch” based on the types of stories they cover. Do a little research to make sure you are connecting with the best contact at the media outlet you are targeting. Today’s digital and social media world makes it easier than ever to track down the right journalist. A good pitch can be accomplished through email, or even LinkedIn. Just make sure to keep your teaser short (no more than two paragraphs.) Remember, you are trying to grab a reporter’s attention, not tell your whole story. Through this type of tailored pitching, we’ve secured coverage for an array of companies in top tier media outlets such as USA Today, Real Simple magazine, CNN, The New York Times, Good Housekeeping and more. No press release needed. Find your Story: You don’t need to spend major dollars to define and refine your messaging. When it comes to getting your company editorial coverage, it comes down to one simple question: Why would anyone care? Answer that, and you have the basics for a story pitch. Does your company offer a solution that doesn’t exist elsewhere? How is your business different or better than others? What’s unusual or interesting about your story? Take a look at your story from an outside point of view and you’ve got the makings of the right message. Reporters want to cover stories that have viewer/reader benefits for their audience. One of our entrepreneurial clients Michele Welsh inventor of SafetyTat, had the opportunity to be on the Katie Show with Katie Couric, when we focused the news angle on how her invention helps parents ease anxiety at public places. The SafetyTat serves as a temporary tattoo in case the child is lost. It’s a problem many parents can relate to and that problem-solution pitch was enough to catch the attention of national producers. Give, Don’t Receive: Ask not what the media can do for you, but what you can do for the media. One of the best ways to get national exposure is to position yourself or someone within your company as an expert. Can you offer insights into a timely news story? Reporters are always looking for good sources who can provide interesting quotes or perspective on various stories. This is an easy way to get your company editorial exposure and it puts you in a good position by making contacts in the media. An author client of ours, who wrote a book on customer service, made himself available to reporters each time there was a customer service mishap story in the news and he landed national exposure with Fast Company, Forbes, Boston Globe and others. Plus, you can go a step further and assemble content which press outlets can easily run; either specific tips or a full bylined article that credits you and your company as a source. Go Global, but think Local: Landing a feature in the Wall Street Journal or on Good Morning America is fantastic, but not likely right out of the gate—especially if you’re doing things on your own. Your local market, on the other hand, provides a perfect opportunity for exposure. TV stations typically have morning and midday lifestyle shows that can be the ideal venue for a feature segment. Local newspapers are likely to be interested in your business startup and entrepreneurial story. Again these media outlets are looking for good stories; all you have to do is reach out! A local story can extend well beyond your local market. The inventors of a reusable grocery bag were featured in their local Denver newspaper, which then was syndicated and ended up running in newspapers around the country. Another client was showcased in a Seattle TV segment, which caught the eye of a national producer and led to a feature on the Today Show. Timeliness is next to Godliness: Plain and simple—if you don’t attach a timely angle to your media pitch—it’s not news. If your company is brand new, that can be a well-timed angle in itself. If your company has been around a bit, then look for other ways to make your company relevant NOW. That may mean connecting to other current stories and trends in the news, or perhaps there is seasonality to the story that makes it more relevant now than say six months ago or six months from now. Think in current and timely terms and you’ll increase your chances of media exposure. Millennial business owners are confident in the future of the U.S. economy and the success of their own companies, according to The Business Journals SMB Insights study, which measures how Millennials and Boomers compare. Nine out of ten Millennial entrepreneurs are confident they will maintain their current lifestyle throughout retirement and are investing at a rate 29% higher than Boomers. Millennial business owners are more concerned about the environment and global warming than Boomers, who respect green values but are less likely to incorporate sustainability into their day-to-day operations. Fifty-one percent of Millennial business owners are making strong commitments to integrate sustainability into their business products and services compared to 41% of Boomers. Millennial business owners grew up with technology. They consume business news most frequently via mobile or electronic device citing speed, breadth of resources and convenience as key benefits. Six out of ten prefer shopping on-line versus in-store for their business compared to 48% of Boomers. More than one-third of Millennial business owners make investment trades online and 46% source new hires from online sources. You can download a complimentary copy of the complete white paper. To see an infographic of the data, click here. If you plan to launch a new venture, product, or service in 2016, make it different from those currently available. Different is better than better. For example, the Apple MacBook is different from Windows laptops: more user friendly, more graphical, more unique tools and applications for publishing, photos, music, and video. Unlike HP, Lenovo, and Dell, Apple developed both the hardware and the operating system and tightly integrated them. Not coincidentally, Apple’s slogan for many years was “Think Different.” Over the years, Apple steadily took market share away from Windows. In 2010, for the first time, the market cap of Apple exceeded that of Microsoft. In 2011, Apple became the most valuable company in the world. Different is better than better. When I say “better”—the second “better” in “Different is better than better”—I mean quantitatively better than what is currently available. HP, Lenovo, and Dell laptops are each better than the other in some way: a 20% longer battery life, a 15% larger screen, or 25% more storage. Especially for a start-up, such a quantitative advantage is at best tenuous. Your startup’s competitors likely include companies that are larger, better established, and better known than you. In most industries, quantitative improvements in performance and cost happen continually. A purely quantitative advantage is hard for a start-up to sustain. Other dentists require limited-mobility patients to come into their dental offices. But you make house calls. Other electricians and carpenters recommend each other. But you know that so many jobs involve both skills that the two of you use online tools to integrate your scheduling, service delivery, and billing. Other call centers allow customers to complete satisfaction surveys after the call. But you ask permission to record calls and use audio processing to measure tension or anger in the customer’s voice, track whether it trended up or down in the course of the call with your agent, and flag outliers. Your different product or service will not be for every customer, whether consumer or business. That’s okay. If you can earn the loyalty of a small but sufficiently strong set of customers, they will become repeat customers for your product or service; will buy more of your product or service over time; and recommend you to their friends or colleagues, so you will further benefit from word of mouth. Better means your start-up or new endeavor has to fight larger competitors head-on. Different means finding a dimension without competitors that is valued by some set of customers, and excelling along that dimension. If you can identify and excel along two such dimensions, even better. You won’t be competing directly with the established competitors, and you’ll have more time and room to become established yourself. Being different not only gives you a unique customer set, it also makes it harder for established competitors to respond to you. Harvard Business School professor Clayton Christensen meticulously documented this effect in his classic The Innovator’s Dilemma for the disk drive industry. In the 1980s and ‘90s, established hard disk drive vendors found it hard to shift to new, smaller form factors—first 5.25′′, then 3′′, then 2′′, then 1.8′′—even though the smaller form factor drives were better suited for each new generation of smaller, more portable computers. The established vendors’ existing customers—mainframe and minicomputer manufacturers—wanted high storage capacity and low price per megabyte. But the new form factors (initially) had both lower capacity and higher price per megabyte, and thus were ill-suited to satisfy the needs of established vendor’s customers. In each case, one or more upstart disk manufacturers who did not compete in larger form factors won the market for the smaller form factor drives. Different was better than better. List the top three to four reasons customers choose among existing companies that address similar needs to the ones you plan to address. Now think of reasons those customers would pick you instead; only list reasons that don’t apply to the other companies. These reasons differentiate you. “Better” means your start-up has to fight larger competitors head-on. Instead, be different in a way that is deeply valued by some set of customers. You won’t have to compete directly, and you’ll have more time and room to get established. Your differentiation may be either core or supporting the need you address; either could be key to your success. As your customers buy from you again and again, and tell others about you, you will grow with them. Thanks to social media, building the audience for your startup’s message is easier and more affordable than ever before. But it still takes time and effort to establish your voice on social media and keep your company at the top of your audience’s feeds. It can seem overwhelming, but leveraging a few affordable tools and bringing in some social media help can set you up for social media success. Integrate your channels as much as you can. Make sure you’ve got a plan for publishing blog content, sharing that content across the channels you own, and finding content that will resonate with your target audience. Tools like CoSchedule (or Trello’s new calendaring feature) help you integrate your blog posts with your social channels. Content aggregators like Feedly and Buffer’s new “Feeds” feature make it easy to find shareable content and add it to your social schedule. Find budget-friendly tools to manage all your social networks. Buffer and Hootsuite are great, and their free accounts should work for most small businesses or solopreneurs. Buffer lets you easily schedule posts so you have a steady stream of content being pushed to your social accounts. Hootsuite allows you to schedule and share posts, but it’s not as well laid out for that as Buffer. What Hootsuite really brings to the table is the ability to monitor all of your accounts in one place and easily respond to direct messages, shares and retweets. Harness the power of images. Add an extra punch to your social media content with images that carry a professional touch. Tools like Canva and Pablomake it easy for you to create really slick graphics to share socially, and images are usually free or very low-cost. Pablo creates images just for social sharing and is integrated with Buffer. Canva can do everything from Facebook images to flyers and business cards. Social media is a terrific way to connect with more customers and personalize your brand experience for each of them. And by putting together a plan to make the most of each of your channels, you’ll see the results in your bottom line. Restaurant Startup features restaurateur and TV personality Joe Bastianich and chef and restaurateur Tim Love, who vie to invest their own money in restaurant concepts they believe could make them millions. Joining the deal table this season is Elizabeth Blau, a restaurateur and consultant who advises hospitality companies around the world. Each week on Restaurant Startup, two teams are invited to pitch their ideas to a panel of two investors. But only one team gets the keys to a working restaurant in Los Angeles. They get 36 hours and $7,500 to put their concept to the test and create a business plan, come up with a branding campaign, and launch their dream restaurant. Under the watchful eye of culinary consultant Antonia Lofaso the aspiring food moguls open their doors, serve their food, and test their concept on the public. Based on the reaction from the diners, the quality of the branding, and the viability of the business plan, Bastianich, Love, and Blau decide whether or not they will offer funding. You can watch a sneak peek here. Biz2Credit, a small business financial technology platform, recently launched the BizAnalyzer™ Score Simulator Tool, which allows small business owners to capture a personalized snapshot of their business health. The Score Simulator acts as a virtual CFO, evaluating how cyclical changes to revenue, cash flow, credit scores and other key metrics affect their creditworthiness in the eyes of lenders. The goal of the Simulator is to help small business owners make better, more strategic financial decisions. Here’s an example: a pizza shop wants to see how a 20% increase in revenues will affect his/her financing terms for future products. The pizza shop may have a current BizAnalyzer Score of 56, but with the proposed increase in revenue, it rises to 62. This means that the shop will have options to available to him/her with longer terms, larger amounts, and better rates. To use the Score Simulator, small business owners can sign up here. The solution is particularly helpful for small, independent online retailers looking for uncomplicated ways to streamline online payments through their sites. Braintree is fee free for up to $50K in transactions, while JotForm is free for up to 10 payment submissions per month, and only $19 a month after that. It’s easy to set up the integration. On JotForm’s easy form builder, click on “Payment Tools” then select Braintree. From that, the user enters their Braintree account information and is good to go. JotForm has 8,000 ready-made form templates, 100 integrations and more than 380 widgets, making it one of the most popular form builders for companies all over the world.